One solution to get one minute faster? Nope. Sorry. Can’t do it. Like so many other things, there are a whole bunch of different ways to get to the same end result. Let’s look at some possible solutions and start figuring out some ways to zoom. Becoming a faster runner is tied to being a consistent runner, which essentially translates to showing up, running, staying healthy, staying committed, being persistent, and being patient. Consistency is tied to how you structure your running, as well as how you think about yourself and your running. Whatever training decisions you make, you have to do it in a way that allows you to show up for every run healthy, fueled, and focused on your individual process. Finally, finding a minute anywhere in your running involves improving your body’s capacity to move faster, with more force, and with efficient motions contributing to forward movement. Will this take patience? Yes. Will it be easier to get one minute faster in a 10k race than in a 5k race? Yes, because you are out there longer, smaller improvements add up to that minute more quickly. Will it be easier to get one minute faster in a 5k race than in one single, fast mile? Yes, for the same reasons. Does each one of those successes result from you actually running faster? Yes! As you seek speed, there are some things that you can include in every run, while there are some elements which need to be looked at like medicine: the right dose is good, too much has potentially damaging side effects. That said, what are some things you can do to improve your speed? There has been quite a bit of research looking at where the foot lands in relation to the knee, in relation to the body’s center of gravity (technically, to its center of mass), where on the foot the landing point should be, how often each foot should land each minute, and how you should be holding the rest of your body. 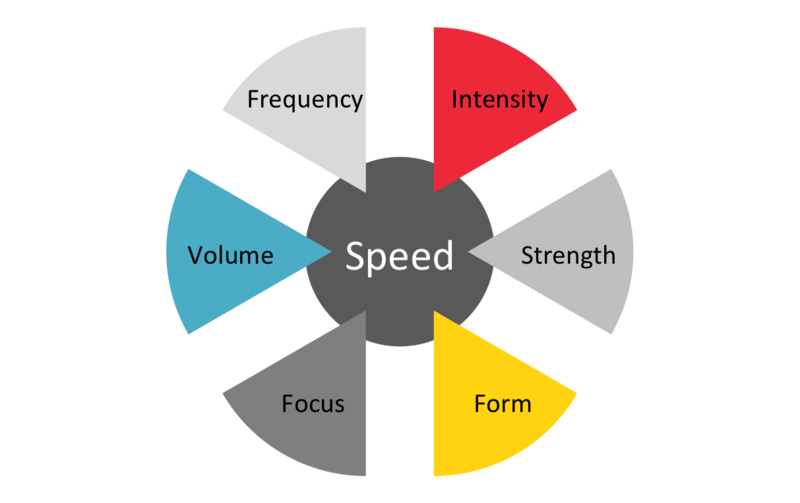 There is no one single factor identified as the ”best,” they all have the potential to remove some inefficiency or to make you a bit faster. I’m going to suggest picking two form targets to start the quest for speed: stride frequency and landing your foot under your knee. Stride frequency is how often your feet hit the pavement each minute, the actual step count. Speed is a function of how many steps you take and how long each step is (stride frequency x stride length). Fast runners vary in how many steps they take each minute, though you may read that 180 strides per minute is a magic number. There is no magic number, and elite runners vary around that with some hitting their feet to the ground more often, some hitting the ground less often. That said, frequency can make a difference when it comes to your speed. Faster feet, at the same stride length (even a slightly shorter stride length) can help you go faster. Set a timer for 15 seconds or look at your watch. Count each time your left foot hits the ground in that 15 seconds while you run, wherever you run, whether it’s on the road, trail, or treadmill. Do this 3 – 5 times each run. If you are under 20 left foot steps in that 15 seconds, try to add one more. Every 7-10 days, try to add another, until you are at 23 left foot strikes as a consistent pattern. See that? You change a little bit, get used to it, then change a little bit more. Look down every now and again as you are running. Or, even better, get a friend to take a video of you with your cellphone. If you see your foot landing out in front of your knee, you are “hitting the brakes.” For the record, braking slows you down. Land the foot under the knee, support your body, and keep moving forward. Strides are short, almost sprints. Each stride lasts for 20 seconds. You start by accelerating to an effort that is fast for you, yet below an all-out, elbow flailing sprint. The focus is quick legs, quick feet, and feeling speedy, with a focus on where you are going. These efforts teach your body to move all the parts swiftly and in a coordinated way. Do 3-4 at the end of every run, with 60 to 90 seconds rest in between each one. There is research evidence indicating that focusing on a target outside of your body helps to improve your performance. Choosing to focus on a point down the road or paying attention to the rhythmic sound of your feet may allow you to perform with more coordination compared to focusing on what hurts, how hard it is, or what a poor choice that song was. At the end of every run, give yourself credit for what you have done well. How often do you forget that part? It’s important for how you feel about your ability and your progress. I use a process of “Good, Better, How” you did something well, recognize it. Then, think about what could have gone even better. “Everything” is not a choice. Identify one thing that you know could have gone better, and figure out how. Did you need to fuel better before your run? Was your attention on work, family, list-making instead of the process of your run? Did you cheat yourself by talking yourself out of an effort that you could have done, in retrospect? “How” makes an action plan for what you will do differently next time. The muscles along the back side of your leg (calves, hamstrings, gluteus maximus) provide most of the propulsion for running. Stronger muscles can produce more force. One way to build strength in running muscles is adding hills into your running. The treadmill is a great place to start adding hill work into your program because you can control your pace, which results in controlling your effort as you are adding this type of work to your program. After a 10 minute easy warm up run, find a steady pace where you can sing your favorite song out loud, which is a pretty easy pace. The speed is what the speed is; whatever the speed number says, really, let it be. Run steady for 3 minutes, then increase the incline of the treadmill to 3% for 1 minute, then back down 0% and your steady pace. The speed doesn’t change, only the incline. Start by doing this 4 times. The next week do it 5 times. The next week, 6 times. The week after that, increase the speed by .2 mph when you increase the incline, then decrease both to recover. The next two weeks follow a similar pattern, increase the speed of the hill, decrease the speed when you return to flat, steady running. A program of strength training in the gym can also be effective and your body will be able to transfer that strength to the road. As you are adding other elements to your running, consider consulting a fitness professional about the best ways for adding run-targeted strength work into a ramped-up running program. Remember, consistency is the primary target. Here’s the part where consistency gets threatened. You can increase one incremental bit each week. One. Uno. One at a time. When you increase volume, you need time to adapt to the change, to practice it, to get used to it. “Oh, I’m tough, I can handle this, I want to get faster now.” Maybe you can, but there is a huge risk, with more potential downside than benefit. Building endurance is building infrastructure; you need to build delivery systems at the muscles you are using, including developing capillaries for delivering blood and mitochondria in the cells for fuel production. Building infrastructure takes time – not intense effort, just time. In adding volume, think 10% maximum. You may want to add time to the running you currently do, or you may want to add one new run, whichever option is right for you. If you are currently running 3 times each week for 30 minutes each time, you are running 90 minutes each week. The first week, you can add 10% total time, which is 9 minutes. You do this by adding a little bit more time to two of the runs, so your week now has a 30 minute run, a 33 minute run, and a 36 minute run. Week 2, only add 5%, so, in this example, you only add 5 minutes total, making your runs 30 min, 35 min, and 39 min. Week 3, add 10% again (35 min, 35 min, 44 min), week 4 stay right there, don’t add or subtract, week 5 increase another 10% (35 min, 40 min, 50 min), then, week 6 stay at that new level, mastering it, being consistent, adapting. The other option is to increase the frequency of your running. You still end up adding volume, but you do it in the form of adding one more run each week. If you are already running 5 days each week, add a day of cross training, either on a machine, like a Cybex Arc Trainer, or heading outside for a bike ride or a swim. If you have the time, and choose the frequency option, in the first week the new run will be 10% of your total volume. If during the previous 2 weeks you have been running 90 minutes total for the week, the brand new 4th run will be 9 minutes. Barely seems worth it, right? It is. Remember the infrastructure. Time builds infrastructure. Infrastructure allows you to do what you want, sustain it, and repeat it. The progression for increasing the added run follows the same pattern as the progression for adding volume to your current number of runs. You do this for 6 weeks, are you fast yet? You will notice changes and those changes will be unique to you. Some of you will have started to find that speed already, some of you may be noticing that the runs are easier, but not yet faster. We all adapt at different rates. Patience, consistency, process. Now, after 6 weeks, if you have been healthy and consistent, you may want to add one more piece, intensity, in the form of speed work (specific, fast efforts). If you have been hurting, or sick, or have missed several sessions because life interfered, stick with strides, focus, hills, and consistent volume for a few more weeks. If the routine has become routine, adding intensity is a process of adding longer, faster efforts. This is the most challenging addition to a running program, because you have to be extremely disciplined. Every hard effort has a very, very easy recovery. The easy is just as important as the hard for getting faster. This is the place where the medicine and side effects analogy is the most relevant. Without adequate recovery, you will not be able to maintain consistency and consistency will lead to more improvement, over time, than any single training session. When you add intensity, you will want to keep the hill run, and you will want to keep the longer run, so this becomes one of the other runs. You want to try to have a very easy day or an off day following this one. Warm up with at least 10 minutes of easy running and a set of 3-4 strides. You want to build into the first 2 or 3 of your intervals, letting your body adapt to the effort and the speed. Discomfort, in the form of generalized hard effort, is okay. Pain is not. If you are feeling a specific pain, err on the side of caution, stop, rest, and return another time. Pain is not weakness leaving the body or a sign that you are working hard enough, pain is a warning sign that it is important to respect. This difference between discomfort and pain applies to all of your efforts, in every run you do. Every change brings a new challenge and every challenge allows you to adapt and progress. Intelligently adding challenges into your running will allow you to start to adapt to new efforts and new paces. There is no secret solution to finding a minute at any distance you have as a goal. There is consistency, change, and patience. Rushing to include everything, to do it more, to go harder may not offer your body time to build infrastructure, get stronger, and move faster. Being consistent, systematic, and patient just might. You are looking for progress in each of those areas so you can experience your targeted end result, a faster you. This article was recently quoted in Shape Magazine. Click here to view the full article on how to shave a minute off your mile time. 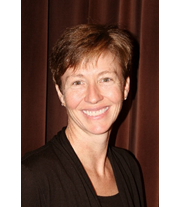 Susan Sotir, Ph.D., works with the Cybex Research Institute and is a frequent guest blogger on our site. She earned her Ph.D. in Sport and Exercise Psychology from Springfield College, where her research examined the physiological and psychological effects of mental skill instruction. She also holds coaching certifications from USA Triathlon, the American Swimming Coaches Association, and the National Strength and Conditioning Association.